➢ “Star Trek: Discovery, the first new Trek series in 16 years, feels welcomely familiar and also surprisingly fresh, bringing together established iconography and new ideas for a series that, based on the first three episodes screened for critics, exists in a space where nothing, including the status quo, is safe … While Discovery is fundamentally quite different from much of the Trek that’s come before, its engagement with the franchise, and willingness to both celebrate and examine its core values, keep it true to that spirit.” — IndieWire. ➢ “What makes Discovery work so well, is how, despite being set 10(ish) years before Kirk and company launched their five-year mission in TOS, it pays loving tribute to every aspect of the franchise, from the shows to the movies, while decidedly pushing Star Trek firmly into the present of TV … Discovery has to please modern audiences, so the action is huge and thrilling, on par with any of the feature films (and surpassing several). But at the core of the first two episodes are ideas about what humanity means, and what we could become.” — TV Guide. ➢ “As big as the first two episodes are, though, I’ve seen the third episode as well and it isn’t nearly that expansive or handsome. It’s a somewhat claustrophobic, largely indoors ship-hopping adventure that’s closer to an Alien-style haunted house in space than the room-to-breathe and it also suffers from murky, spacial geography-challenged action scenes when it isn’t just characters hovering in rooms talking at each other, which is most of the time. The special effects in the first two episodes were worthy of praise; the effects in the third barely worthy of comment.” — The Hollywood Reporter. 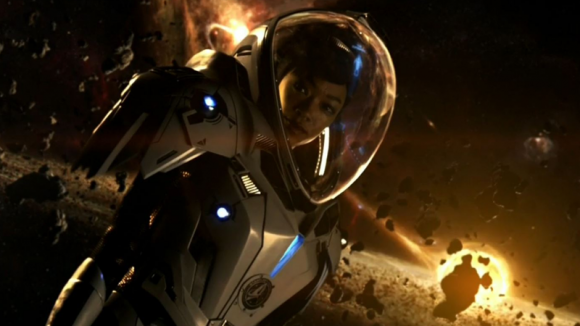 ➢ “The first three hours of Star Trek: Discovery provide serviceable space opera and reasonably exciting interstellar battles. And as a whole, the drama takes the optimism at the core of Gene Roddenberry’s vision and, in the tradition of the best of the Star Trek canon, uses it to examine the choices of well-intentioned characters faced with compromises, mysteries, alien cultures and moral dilemmas. Discovery may be set in a time of war, but it is not uniformly grim; there are some welcome comedic touches that hit the mark without detracting from the drama’s generally earnest approach.” — Variety. ➢ “Despite its often over-explanatory scripts, jittery direction, scattered plot points, silly Beatles, and Chuck Yeager and Amelia Earhart shout outs, Discovery is conventional and solidly satisfying serialised TV that speaks to our times, as war drums beat culturally and perhaps internationally … From what I’ve seen, Discovery is essentially NCIS meets Aliens, in the best way.” — Deadline Hollywood. Just watched the first episode and really enjoyed it. A good modern Trek series. Fresh? Yes, it looks and sounds great but thematically this is the boring by-the-numbers Trek. Not even worthy of hiding in the shadow of Bryan Fuller’s amazing American Gods. The only saving grace is that it’s not as bad as The Orville. PS: Fuller left after the first two episodes, so ep3 may be an improvement.